The Indian patent office has published Patent (Amendment) rules on 16th May, 2016 and made these rules effective thereto. Further, a clarification notice has also been published on 18th May, 2016. We are providing hereinbelow some of the key provisions in the amendment for your easy reference. 1.1. Introducing expedited examination system: The Patent office has introduced a new expedited examination system for fast track examination of patent applications. According to the new system, an applicant may file a request for expedited examination for his/her patent application. B). that the applicant is a startup company as defined by the instant rules. The request for expedited examination can now be filed by paying the relevant fees i.e. INR 8,000 for a natural person/startup company; INR 25,000 for a small entity and INR 60,000 for others. Provisions are also given in the new rules to convert pending request for examinations into expedited examination requests. Specifically, a request for examination may be converted into a request for expedited examination by paying the relevant deficit fees [i.e. INR 4,000 for a natural person/startup company; INR 15,000 for a small entity and INR 40,000 for others] & submitting the requisite documents. Under the new system, the time for preparing the examination report by the patent examiner shall ordinarily be 1 month but not exceeding 2 months from the date of reference of the application to him by the Controller. Further, the period within which the Controller shall dispose of the report of the examiner shall be 1 month from the date of receipt of such report by the Controller. The first statement of objection shall be issued in 15 days from the date of disposal of the report of the examiner by the controller. Right now the choice of selecting Indian patent office as an ISA or IPEA is limitedly available mainly to PCT applicants from India. This means that the access to expedited system is available to either domestic Indian applicants or first filers in India. It will be interesting to see if the patent office extends the expedited examination system to foreign applicants? 1.2. Time reduction for replying to office action issued on or after 16th May, 2016: One of the most important developments in the new rules is the reduction in time period to respond to office actions. Many users of the patent system in the past have complained about the dilatory and discreet nature of 12 months acceptance period in the Indian patent system. Taking note of the concerns, the patent office has reduced the time for putting an application in order for grant to 6 months from earlier 12 month limit from the issuance of the first examination report. The timeline can be extended by another 3 months upon request along with paying the prescribed fee. It is also cleared in the notice dated 18th May, 2016 that the time period for putting an application in order for grant for the office action issued before 16th May, 2016 shall remain to be 12 months from issuance of the first examination report. This means that the reduction in acceptance period for office action issued before 16th May, 2016 will remain unchanged. 1.3. Expediting disposal of the application: In order to encourage patent examiners to proactively conclude the patent prosecution proceedings, the patent office has also set a deadline to wrap up proceedings in front of the distinguished office. In order to encourage the patent applicants to conclude the proceedings proactively on their side, the patent office has limited the number of adjournments in the hearing process to not more than 2 adjournments, with each adjournment shall not be for more than 30 days. Further, the patent office has now set up 15 day deadline for any documentary submissions post any hearings. Overall, the above measures seem to be steps in the right direction to expedite the examination. It will allow the patent office to shrug it’s distinction of being a slow processing offices. The measure to introduce time limits for the patent examiners and applicants alike gives the correct signals to all stake-holders that the Indian patent office means business. The Indian patent office has issued new rules in order to streamline the examination process. The patent office has issued new rules to standardize the practice for submission of Abstract and Drawings. 2.1. Drawings: The patent office will now require a specific reference of the drawings in the complete specification. Further, the features illustrated in the drawings shall be followed by their respective reference signs in parentheses in the claims. 2.2. Abstract: The patent office now requires the abstract to contain a concise summary of the matter contained in the specification and the summary to indicate clearly the technical field to which the invention belongs, technical advancement of the invention as compared to the existing knowledge and principal use of the invention excluding any speculative use and where necessary. Further, the abstract shall contain the chemical formula, which characterizes the invention. 3.1. Power of attorney: The new rules mandate submission of a power of attorney within a period of 3 months (previously there was no such official prescribed time period) from the date of filing of application in India. 3.2. Application withdrawal system: The new rules will now allow an applicant to withdraw his/ her patent application any time before the examination of the said application. 3.3. Introduction of New Forms & Changes in Format: Please note that the format of Form 1, Form 3, Form 4, Form 13, and Form 28 has been changed. New forms: Form-18A [REQUEST FOR EXPEDITED EXAMINATION OF APPLICATION FOR PATENT], Form-29 [REQUEST FOR WITHDRAWAL OF THE APPLICATION FOR PATENT] and Form-30 [WHEN NO OTHER FORM IS PRESCRIBED], have been introduced. 3.4. Refundable fee: The new rules have provided for provisions for refund of fees in case it has been paid twice while filing of forms in the online filing system. The new rules have also provisioned for refund of examination fees in case the application is withdrawn before examination. 3.5. Request for examination (RFE) deadline for divisional applications: The patent office now mandates that RFE should be filed at the time of filing the divisional application. Earlier deadline for filing RFE was 6 months from the date of filing divisional application. 3.6. Amendments to international applications: In the new rules, the patent office has clarified that any application corresponding to an international application under PCT can include amendments under Art. 19 & 34 of PCT. If the applicant wishes to delete any claims, then the new rules allow the applicant to do so in accordance with procedures of amendments set in rule 14 of the consolidated rules. Over the past few years the patent office has endeavored to digitalize the patent prosecution process. The present rules have introduced some welcome changes to continue this effort. 4.1. Electronic submission of documents: The new rules mandate a patent agent representing a client to submit all documents only by electronic transmission duly authenticated, including scanned copies of documents that are required to be submitted in original. It is also cleared in the notice dated 18th May, 2016 that the document which should be submitted in original are a) Power of Attorney, b) proof of the right to make an application, c) deed of assignment, certificate regarding change in name of the applicant, license agreement, etc., d) declaration regarding inventorship, and e) priority documents. 4.2. Hearings through video conference: The patent office has introduced a new mechanism by which hearings in relation to a patent application may be held through video conferencing or other communication devices, thereby making the procedure more practical and cost effective. 4.3. Deadline for Submissions: The new rules mandated that in all cases of hearing, written submissions and the relevant documents shall be filed within fifteen days from the date of hearing. Further, an applicant for patent or a party to a proceeding may make a request for adjournment of the hearing with reasonable cause along with the prescribed fee at least three days before the date of hearing. It is expected that these rules would reduce delays in disposing patent applications. For example, delays caused by adjournments where the applicant/agent is not physically available to attend the hearing could now be avoided. 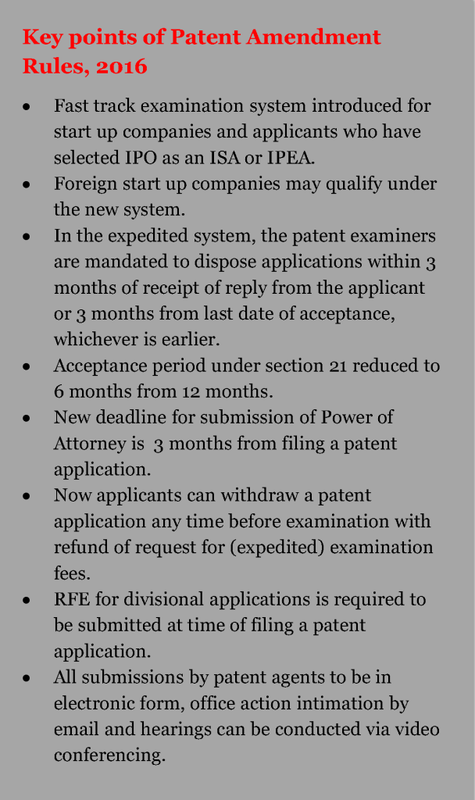 In furtherance to global efforts of incentivizing startup companies, the patent office has incorporated new rules with respect of recognizing startup companies filing patents in India. The government has now inserted another entity category, referred to as “startup” entity in the Amendment rules, 2016. The startup entity could enjoy benefits of expedited examination and reduction in fees (at par with natural persons). 5.1.3. Where it is working towards innovation, development, deployment or commercialization of new products, processes, services driven by technology or IP. Provided that any such entity formed by splitting up or reconstruction of a business already in existence shall not be considered as a startup. c. products or services or processes with no or limited incremental value for customers or workflow, would not be covered under this definition. It is yet to be clarified whether foreign companies (incorporated outside India) could qualify as a startup entity in India and the procedure using which they claim the startup benefits. Although, recent government suggestions indicate that they do. If you have any questions, please feel free to contact us at mail@gip-india.in.